6061 Aluminum is the most common of all the aluminum grades. 6061 offers good corrosion resistance, weldability, and formability. 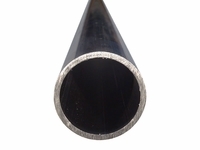 This pipe is inteded for structural applications only and is not pressure tested. Copyright © 2018 All Metals Incorporated. All rights reserved.